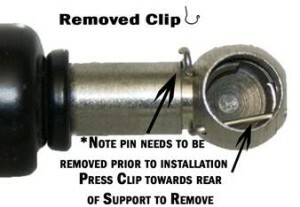 How to Remove the Wire Clip from the Ball Socket. This clip was designed to add an extra layer of safety to the end of a lift support. In most cases the new supports are shipped with them installed and they have to be taken off before installation and reinstalled once on the ball stud. To remove usually you would use a regular or needle nose pliers and slide it from around the collar of the end. This comes off very easily without any major force. Place the lift support end over the ball socket and give it a hard push and it will latch on. In some cases if you have a hammer handy a light tap will push it over the ball. Now give a little pull on the end to make sure it has actually latched onto the ball. Now reinstall the wire clip the same way that it came off. Always remember to install the shaft end first then turn the body clockwise to line up to the other ball socket. Where ever possible the shaft should point downward in the lid CLOSED position. Please fell free to add any comments!